The Son La strawberry and safe farm produce week 2019, the first of its kind, kicked off in Big C Thang Long supermarket in Hanoi on January 18. 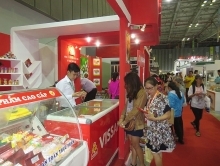 The three-day event attracted 30 units displaying VietGap and GlobalGap-standard products such as fresh strawberry, tea, wild apple, passion fruit, squash, orange, potato, among others. 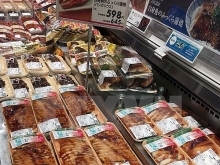 Visitors will also have a chance to taste strawberry-derived products such as jam, candy, fresh juice, yoghurt, siro and several kinds of cake and biscuit. Khuc Tien Ha, Director of Big C Thang Long supermarket, said Son La strawberry is sold at 119,000 VND (5.1 USD) per 500g box, or half of the price of those imported from the Republic of Korea (RoK). At least one tonne of strawberry is expected to be consumed each day during the event. 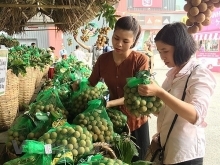 Deputy Director of the provincial Department of Planning and Investment Vu Duc Thuan said it is the first trade promotion activity of Son La in 2019. Strawberry has been grown in Son La for nearly 10 years. It is now home to about 25ha of strawberry, mostly in Moc Chau, Van Ho and Mai Son districts with a total output of more than 300 tonnes. 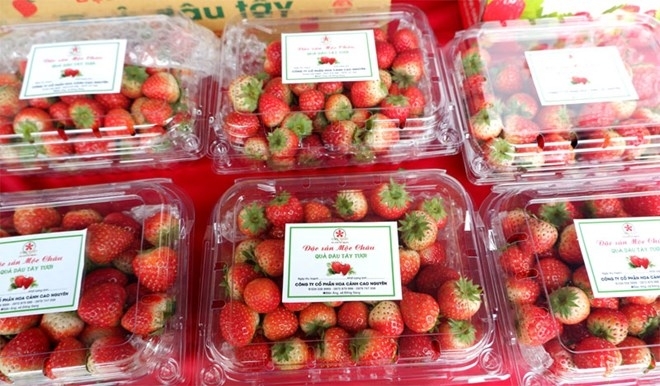 Strawberry varieties imported from Japan, the RoK and Australia well adapt to climate and soil conditions in Moc Chau grassland. At the opening ceremony, representatives from Big C Vietnam, Son La businesses and cooperatives signed an agreement on consumption of Son La safe farm produce in Big C supermarket chain.